The gluten is gone. The dairy is gone. The nightshades have to stay. It was good. If you don’t have an immersion blender, please make sure and read the options under step 6! Sauté the onion and chopped garlic in a soup pot until golden and fragrant. The longer you sauté them (without burning them), the richer flavor you will get in your dishes that ask you to sauté onions. Simmer the mixture a bit, maybe 5-10 minutes, basically just giving the spices enough time to permeate the soup. Mix in the coconut milk and heat to a low simmer. Stir in the basil last, as its delicate flavor can be destroyed by heat, and remove from heat. Option 1: Using an immersion blender, blend and blend until the soup is as smooth as you can get it. Option 2: If you don’t have an immersion blender, then allow the soup to cool enough to blend smooth in blender. If you don’t let it cool, the steam will pop the lid off, burn you, and make a huge mess. Option 3: Leave one cup of cold broth out of the soup and then add this once you remove the soup from the heat to cool the mixture enough (hopefully) for immediate blending. Taste the soup. If it’s too thick, add some more broth (maybe 1/2 cup more) and a splash of coconut milk and reblend. It is a bit hard to tell you exactly how much broth to add because every brand or homemade version of tomato sauce varies in its thickness. Just blame me if it doesn’t taste good. I can take it. Family “gustar” report: We had visitors this evening and everybody liked the soup a lot, 7/7! The kids even had seconds! Just like the old days! For an enhanced version, you may want to check out Fit Moms and Full Plates. My cookbook was open to the page with this recipe because I’ve made it before and it was very good so I was going to make it again. I’m sure you know how it goes. What? Don’t have that. Nope. None of that either. Oooooo. I HAD some of that… Theirs incorporates sausage and kale. Oh, man. Yum. Campbell’s is not my friend, but my goal was to recreate it as much as possible. Kids like familiarity. My recipe is a nice, simple tomato soup particularly easy on the kids’ palates, yet still very comforting to all of the adults. Also fast and easy to make, especially with an immersion blender. I think someday when my kids eat Campbell’s again, they’ll long for this soup. Processed foods sabotage health. Mom’s lean on them and so society denies the sabotage. However, the overweightness of our children, premature development of our young ladies, and ever-decreasing age for things like diabetes, high cholesterol, and heart disease are our witnesses. Please, make the change. Stay the change. Stop depending on bread, dairy, and processed foods and start drawing in more vegetables, fruits, and different cuts of meats. 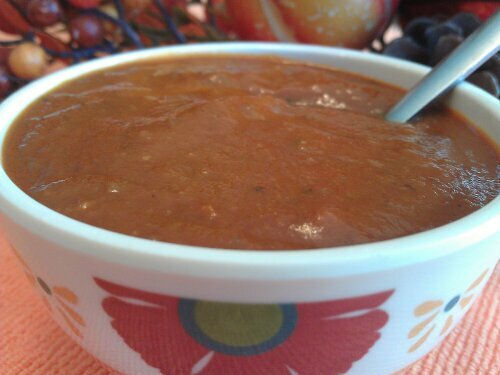 This entry was posted in Dairy-Free, GAPS, GAPS legal soups, Gluten-Free, Recipes, SCD, Whole30 and tagged homemade tomato soup like Campbell's, Tomato soup on October 28, 2013 by thehomeschoolingdoctor. No cans. No nightshades. No… Anything left? (Kidding.) Hope you’re feeling great!